« When you run into a wall… use it! You don’t want it. Where does it go? Where does discarded clothing end up? Some interesting facts. And some more. And more. And a fascinating book that a fellow resale shopkeeper sent me. 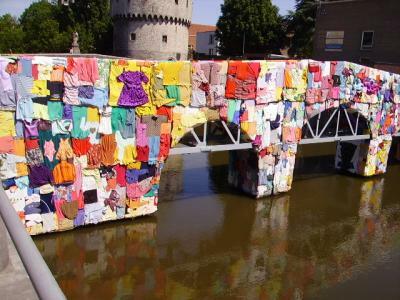 Not all discarded clothing is lucky enough to adorn a bridge. I’m surprised at the 45% figure. Are you? Comment if you like! Read the links, you’d probably be surprised at the information there. I’m just happy to see that most is recycled in some way at all.